First, let me just say, I am probably over-reacting. As a Raptors fan I should probably just be content, right? The Toronto Raptors are having a hell of a season. They were supposed to be terrible, they were supposed to tank. Yet, here we are in March and the team is a lock for the playoffs. Yes, a lock. This is a franchise that spent the last five years just hoping to squeeze into that eighth seed. Yes, the Eastern Conference is terrible. But this is a franchise that needed to feel optimistic again, hopeful even. This Raptors team is easily the most likeable group since that magical 2000-01 season. Everyone on the team has a role, they all play hard, and most importantly, they believe they can win. I believe the Raptors can make a little noise in the playoffs. Yes, they will eventually get throttled by the Miami Heat or the Indiana Pacers, but that feels infinitely better than the immensely crushing sense of ennui that accompanies another trip to the draft lottery (Andrew Wiggins or no). Yeah, it’s been a good season so far for DeRozan and the Raptors. THAT BEING SAID, I worry. I look at the teams in the Eastern Conference, the ones being laughed at by every team in the West and think: Oh no, I don’t like any of these matchups for the Raptors. I get pessimistic. I get scared. And so, let’s talk about the Raptors Playoff Panic Watch. Here are the five teams that the Raptors could potentially play in the first round in order from least to most worrisome. 5) Atlanta Hawks – Pity the poor Atlanta Hawks. Are they still clinging to the eighth seed? Let me check. Yes, they are, with their 28-35 record. Did you know they once appeared to be locked in at third in the conference? They possessed a beautiful big man tandem in Paul Millsap and Al Horford, they had some nice guard play from blossoming Jeff Teague and endlessly sharpshooting Kyle Korver. But then the wheels fell off. Al Horford went down and somehow DeMarre Carroll, Pero Antic and Elton “You forgot I was still alive” Brand became key contributors. I do not worry about the Raptors playing the Hawks in the playoffs. Unfortunately, there is very little chance these two teams will meet. Such is life. 4) Washington Wizards – It is said that the team with the most talented player always has a chance in a playoff series. And in the case of the Raptors and the Wizards, all things being relatively equal, John Wall is that player. Perhaps all things are not equal, though. The Raptors definitely possess a more cogent, thoughtful and, lately, consistent backcourt (Lowry, DeRozan, with Vasquez to assist) while the Wizards contain more weapons in the front court with the heady Nene (if healthy) and the bruising Gortat. But there is that Wall factor, his ability to just go off and drop insane numbers, create shots for himself and teammates at will, and power one-man fast breaks that leave clouds of smoke in their wake. The Wizards are sort of wild and inexperienced, they’ve been a joke for a long time, but they have a certain savant-like character that could align at just the wrong time for the Raptors. 3) Charlotte Bobcats – They’re trying, you’ve got to give them that. This Charlotte team does not have a lot of offensive fire power (they did somehow end up with both a McRoberts and a Douglas-Roberts though). What they do have is the human traction engine, Al Jefferson, and one of the best defenses in the NBA. Yes, read that again, not the Jefferson part, the second thing. The Bobcats are ranked 7th in Defensive Efficiency. Seventh! It stands to reason that if you are going to assemble a team of non-shooters (looking at you, MKG), then you’d better do what you have to do to shore up your defense. And by that logic, if defense is the most important thing in the playoffs, well, maybe Charlotte is in good shape to make a run, offense be damned (still, Big Al tho). Or maybe I’m nervous because the Bobcats have already beaten the Raptors three times this year in close games. Oh yeah, maybe that’s it. 2) Brooklyn Nets – Every bone in my body is telling me not to worry so much. The Nets are broken down, they scream. They lost their best player, they urge. Kevin Garnett has one foot in the grave, they soothe. They have neither a top flight offense or a particularly strong defense, they mention. My bones don’t want to accept that it is March and we are still talking about the Nets. This was a team that was a comical joke at the beginning of the year; undone by injuries, terrible coaching, and an old, seemingly disinterested roster. But, dammit, there are still a lot of veteran ballers on this team. The Nets and the Raptors split the season series this year, 2-2. Three of the four games were close (the fourth was a blowout Raptors win; Deron Williams was absent). My panic over playing the Nets should make no logical sense. They recently traded for Marcus Thornton for God’s sakes! Maybe I’m just having 2007 flashbacks when a disorganized Nets team (led by Kidd, again) ripped through the upstart Raptors like a piece of wet tissue paper. The similarities make me uncomfortable. 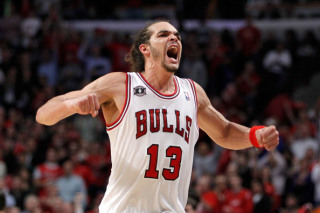 A legitimate threat: Joakim Noah. 1) Chicago Bulls – The Raptors are currently in third place in the Conference with just a one game lead on the hard-charging Bulls. I can’t believe it is March and we are still talking about a Rose-less, Deng-less, Bulls team. A Bulls team that starts, starts, Kirk Hinrich in 2014. A Bulls team that relies on Carlos Boozer. A Bulls team that leans on DJ Augustin’s potent (?!) scoring ability. Asked in December if I cared about the Bulls I would have said, who? That broken down team with the crazy coach that was grinding all of his players into the ground? That team? Are they even going to make the playoffs? But they beat the Miami Heat this week. And just finished grinding up the ascendant Houston Rockets. Joakim Noah is being talked about as an MVP candidate. Have you seen Noah shoot the basketball? This team went on 4- and 5-game win streaks in February. Yes it did. I am scared. In all honesty it looks as though the Raptors likely first round opponent will be Washington or Brooklyn. They’ll probably dodge the Bulls unless they manage to lose the Atlantic Division title to the Nets (an outcome that seemed impossible as recently as two months ago). I’m going to level with you: I believe this Raptors team can do great things, I really do. But I’m still a Toronto Raptors fan, and that means I’m going to panic before I cheer. Bring on the playoffs. Brooklyn and Washington are plenty reasons to worry I hear ya. Nice article. Im not panicking about teams cause there is no pressure at this stage in the rebuild, the playoffs should be a celebration of our growth. Its teams like Washington and Brooklyn that have the pressure on them to win now. 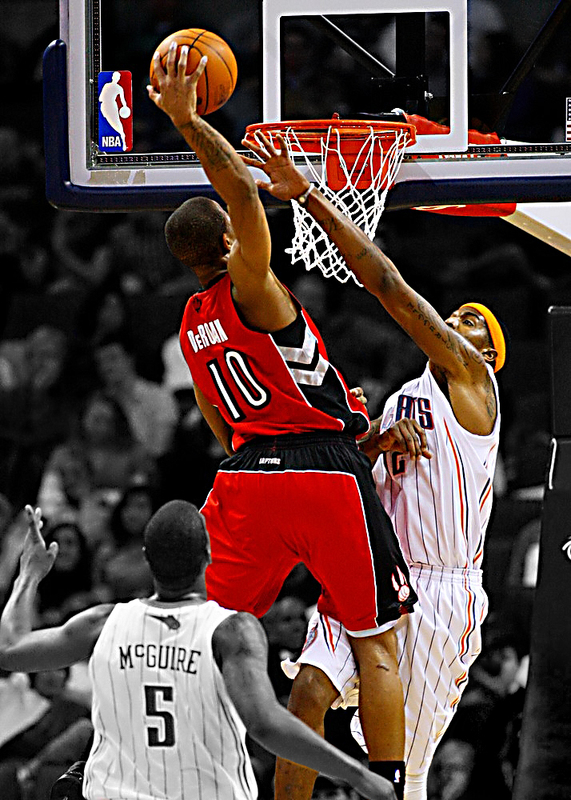 Also, I fully expect DeMar to struggle in his 1st playoff game/series similar how VC and Bosh did. I disagree with rap_fan. There is pressure to at least make it interesting (no first round exit)because they’ve kept Lowry. If they fall off without making some noise then they’ve just made a short sighted decision for no reason.